AMD introduces the Radeon HD 7970 GHz Edition, a new $499 video card with a 1GHz core (1.05GHz with boost) and 3GB GDDR5 memory clocked at 6000MHz. Compared to the original Radeon HD 7970, the new card has a 75MHz higher core and introduces AMD's PowerTune Technology with Boost, which is basically AMD's name for its GPU overclocking technology. Retail availability is expected next week, with wide volume to follow the week after that. 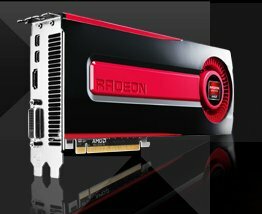 Today AMD (NYSE: AMD) launched the world’s fastest graphics processing unit (GPU), the AMD Radeon™ HD 7970 GHz Edition. The AMD Radeon™ HD 7970 GHz Edition uses AMD’s innovative Graphics Core Next (GCN) architecture to deliver astonishing performance and breathtaking image quality, providing world-class gameplay at the highest resolutions in the most demanding games such as Battlefield 3, Deus Ex: Human Revolution and DiRT Showdown. The AMD Radeon HD 7970 GHz Edition provides ground-breaking GPU compute functionality through advanced AMD App Acceleration technology, allowing users to enjoy lightning-fast gameplay and realistic physics effects. AMD App Acceleration technology also optimizes common tasks like encrypted file compression and speeds up demanding digital content creation suites, while providing exceptional online video and Blu-ray video experiences3. No other graphics card comes close to the performance and features of the AMD Radeon HD 7970 GHz Edition. The AMD Radeon HD 7970 GHz Edition comes fully equipped with 3GBs of ultra-fast GDDR5 frame buffer, AMD Eyefinity 2.0 technology, and support for PCI Express 3.0 and multi-GPU configurations with AMD CrossFire™ technology.